Pflueger offers two undermount spincast reels. The 5-bearing/9-oz President model uses 4/6/8 pound test fishing line. The 2-bearing/5.2-oz Trion model handles 2/4/6 pound test fishing line. I bought the PRES6USCX and haven't tried the TRIMSSCB. Using the trigger became intuitive after the first few casts. It's easy to use, but I would not classify this reel as "youth level" because of its advanced features, size, mounting style and price. This reel's technology and heavy duty construction make it a long-term keeper. Whichever line/rod combination I used, this reel gave me long smooth casts and precise targeting every time. It's dual pickup pins and gearing were quick, smooth and precise. With 4 lb and 6 lb lines, I found this reel works best with bait, and weights starting at 1/4 oz to 3/8 oz. (I didn't experiment with the 8 lb line.) The spinning rods I used were 5'6" to 6'9" in various actions, and they all performed well. This reel's retrieve rate is in the ball park for most spincast reels. Pflueger only hints at a maximum drag weight, but I found the quick-to-adjust side mounted dial will go from zero to more than enough for it's recommended line weights. It has adequate spool capacities, a bit longer than most. Re-spooling a fresh line was quick, easy, and economical. Switching spools is unnecessary — and doing so is not fool-proof. For an underspin trigger spincast reel, this reel is top of the line. It did everything it was designed to do. I had no performance issues whatsoever. Gear Ratio/Retrieve Rate: 3.4:1 / 14.5"
My typical fishing is high mountain lake trout. My usual reels are spinning. 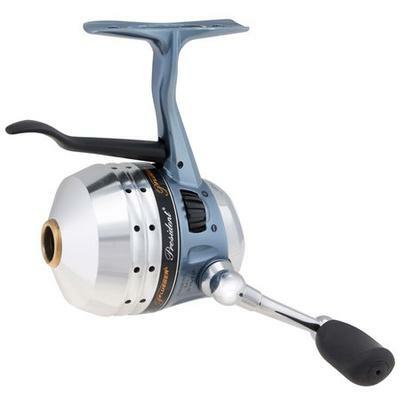 I bought the Pflueger President Spincast 6U Reel PRES6USCX out of curiosity and am delighted with its performance. Would definitely recommend this reel. Fun to cast with, especially with drop shot rigs. Join in and write your own page! It's easy to do. How? Simply click here to return to Fishing Reel Reviews.